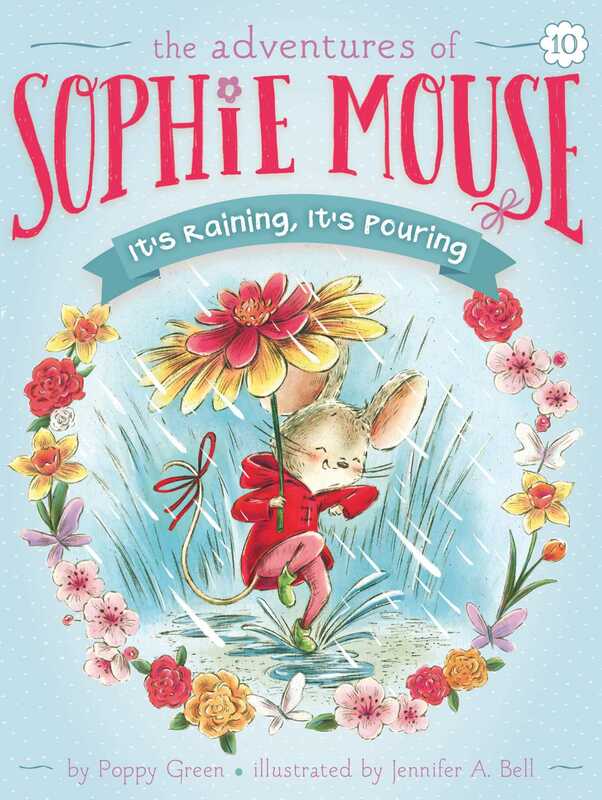 Sophie Mouse and her furry friends prepare for a big storm that’s headed right for Silverlake Forest in this tenth charming book of The Adventures of Sophie Mouse series! Sophie Mouse has been preparing for the first-ever Silverlake Forest Spring Fling for weeks. She has come up with activities, like a Lily Pad Dance, she’s thought of games to play, and she’s created all sorts of fun hats, masks, and other costumes for her friends to wear. But the day of the Spring Fling is approaching, and Sophie’s twitching whiskers are telling her that the rain is too! Sure enough, it rains and it pours. Will Sophie figure out a way to save the day or will all her hard work go to down the drain? Sophie Mouse ran to the window. She glanced up at the sky. The clouds looked darker than the last time she’d checked. Sophie stretched her hand outside. No raindrops. “It’s not raining yet!” Sophie cried, running back into the kitchen. Her whiskers were tingling. She could tell the rain was coming. But maybe there was just enough time for their picnic. It was Sunday morning. In the Mouse family’s house at the base of the oak tree, Mrs. Mouse had made her famous vanilla-bean scones. As they cooled, the sweet scent of the vanilla filled the kitchen. Mr. Mouse flipped huckleberry pancakes on the griddle. Sizzle! Sophie and her little brother, Winston, peeked into the oven. They had worked together to make a banana-dandelion bread. It was rising! Soon it would be done! Sophie got the picnic basket ready. Then she ran upstairs to the linen closet to get the picnic blanket. She had the perfect spot in mind: on the bank of the stream near the playground. Afterward, she could scurry over to Hattie’s house to say hello! Lily Mouse tucked the scones into the basket. George Mouse added the pancakes. Soon the banana-dandelion bread was done and packed, along with jams and jars of mint tea. “Okay! Let’s go!” Sophie exclaimed. She picked up the basket. Winston grabbed the blanket. And the Mouse family stepped outside. Sophie felt three big raindrops—one on her ear, one on her shoulder, and one on the tip of her nose. The four mice gazed upward, holding their palms out. Plip! Plop! Plip! Plippity-plippity, plop-plop-plop . . . The rain was picking up. Winston threw the blanket over the basket to protect it. She smiled hopefully. But no one else seemed excited about the idea. So back inside they went. In the living room, they pushed back the furniture and spread the blanket on the floor. The yummy food cheered Sophie up. But now and then, she gazed out the window at the gray mist. Sophie’s shoulders drooped. She took another bite of scone. She knew her dad was right, but she still couldn’t help wishing the rain away.